Mommy's Free Reads: Great Easter book! 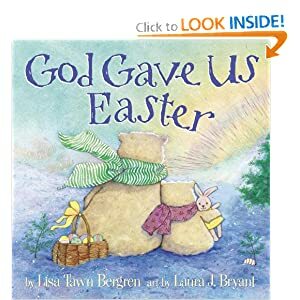 I am a huge fan of the "God gave us" series by Lisa Bergren, so much so that we have all of her books! Each book takes you on the journey of a curious bear cub discovering the answers to her questions, all the while learning about Jesus. The stores have dozens and dozens of books about the true story of Christmas, and yet there really isn't a lot to offer about the real meaning of Easter, which is why I was ecstatic when I saw this book coming out! The pictures are so sweet and precious and the story line was great!The book itself didn't disappoint, and I was extremely glad to add it to our Easter book collection!